This reference book tells a story. A story that I am extremely proud of and that I am very happy to be able to share with you. It is a story about how RensonÂŽ uses its expertise in indoor and outdoor living, eager to enhance user experiences down to the last detail. It allows us to innovate successfully, with an indomitable passion as our driver. We collaborate with a variety of players all over the world in the field of construction, thanks to our presence in more than 80 countries. This has resulted in Â­various eye-catching realisations this year, which I would like to share with you in this reference book. Renson® designs innovative, energy conscious concepts to create healthy, comfortable living and working environments for everyone. The largest construction site in Europe was recently completed in Brussels. The iconic, new NATO headquarters were designed by SOM + Assar Architects based on an image of intertwined fingers, which represent the alliance between the NATO member states. The immense international image of this complex also has a Belgian side: VK Architects & Engineers was responsible for the design of all technology components, Renson® delivered the façade cladding and structural sunscreen protection, and all of this was carried out by Vorsselmans. A gigantic village, all by itself A surface area of 250,000 m2, including 8 office wings around a central hall, space for 4000 employees and an expected number of visitors estimated to be at least 500 people per day - these are just a few figures, which perfectly typify the grandeur of the new NATO headquarters in Brussels. Linius façade cladding: practical and aesthetic This project really stands out with regard to its international image, so Renson® is more than proud that its practical and decorative Linius blade wall system was selected for the façade cladding. Extruded aluminium blades are mounted invisibly on vertical holders, for a really sleek-looking result. With all thinkable facilities close at hand, it is a real village in itself. An industrial building, which contains offices, a conference centre, restaurants, shops and facilities for the press, is also situated round the imposing main building. There, in addition to all the various workshops, space is also available for all logistic and technical units, as well as a personnel centre with a restaurant, cafeteria, sports and leisure-time facilities, etc. Furthermore, and especially for this design, Renson® developed both vertical and horizontal sun protection shields for the new ‘staff centre’, which feature the new Icarus shield-shaped (contego) blades, so as to respect the consequently sleek look & feel of the building. The same is also true for the rotating shutters at the ‘guard house south’, which are made of Renson® Icarus Plano blades that are mounted in Loggia frames, ensuring dynamic sun protection, in function of a comfortable indoor climate. to install these as subtly as possible. And to keep the impact of these sunscreens on the interior as minimal as possible, the profiles were attached with magnets to the steel profiles of the curtain wall. The boxes that contain the canvas rolls have been inserted invisibly in the ceiling, and also the bottom slats disappear completely in the ceiling, whenever the canvas sunscreens are pulled up. Customized solution Nothing was left to chance in this project. Different departments at Renson® held meetings with one another so as to be able to achieve the right result. Our ‘Customized Solutions through Innovation’ (in short CSI) department got down to work with the wishes of the customer, and in the process even developed new profiles for the canvas sunscreen so as to provide a tailor-made solution for this project. 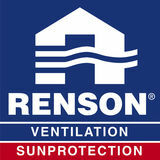 This just shows once more that Renson® is always ready to put all its energy into the most challenging projects. ©	Philippe SAMYN and PARTNERS architects & engineers, LEAD and DESIGN PARTNER. With Studio Valle Progettazioni architects, Buro Happold Limited engineers. With a population of 450 students, and with the commissioning of the new school building, OLV College has finally been able to accommodate every­ one on the same campus. With this new building, both the client and the school direction were, in the first place, interested in healthy classrooms, which provide sufficient fresh air, lots of daylight and comfortable indoor temperatures. Vera Maes, Director of the OLV College, says: “We had a building in mind that would provide the latest technical novelties, not only with regard to infrastructure, but, primarily and above all, in the area of a comfortable indoor climate.” And the architect Jos Leyssens explains: “The students” concentration is directly proportional to the quality of the indoor air. One has, over the years, come to the conclusion that this is essential. ­Furthermore, the requirements with regard to ventilation of classrooms have, of course, increased enormously during the last 10 years.” Demand-controlled ventilation, including a supply of fresh and pre-heated outdoor air In this case, we opted for a C+ ventilation system with Healthconnectors from Renson®. Concretely, every classroom is furnished with 2 Renson® Healthconnectors which are connected to the central ventilation unit. The Healthconnectors are delivered with sensors, which continuously measure the CO2 content of the indoor air, on the basis of which the flow rate of the contaminated indoor air is controlled. This ensures that ventilation is only increased whenever the classrooms are in use. To be able to reconcile the demand-controlled C+ ventilation system with the pre-set heating demands, Invisivent and Fixvent window ventilation units were provided with Thermotune pre-heating elements, which ensure a 24/7 supply of fresh outdoor air. This is a first for a school building. The fresh air entering via the window ventilation units is therefore pre-heated to a minimum temperature of 16° C throughout the entire year. Basic ventilation, combined with sunscreens The pilot project became a success for all involved. That the Fixvent window ventilation unit could be combined in one and the same product with an outdoor canvas sunscreen furthermore offered an ideal solution for avoiding overheating on sunny days, especially in those classrooms with a southern or south-western orientation. With sustainability high on the list of priorities in this project, quite some savings are therefore achieved on (expensive) active cooling during warm periods. “As a matter of fact, we also still win a few degrees of ventilation cooling by letting large streams of colder night air enter via decorative open works in the concrete walls. The coolness of the night air is stored in the mass of the building and is released again the following day,” says Jos Leyssens by way of further explanation. fit, the blades were in each instance sawn off at the correct angle. Even with the expansion joint, which was necessary between the various surfaces, the wall presents a visually beautiful entity. A single entity, smooth over various storeys The wall cladding proceeds seamlessly over the segmented surface and is finished with the same blades which run over the various storeys. The slanted, stepby-step by finish, which is made possible thanks to small in-between supports, follows the edge of the roof, showing the flexibility of the blades for providing a beautiful finish under all circumstances. Integrated doors With the objective of interrupting the wall cladding as little as possible, the doors were also covered with the same aluminium blades from Renson®. The existing doors were therefore provided with supports and clips, which made it possible to align the blades evenly with the façade cladding. To be able to attach the blades, they only had to be sawed to size on-site, which saved quite a lot of time. All rights reserved. Nothing from this edition may be multiplied, or made public in any form or manner, either electronically, mechanically, by photocopying, recording or in any manner without prior written consent from RENSONÂŽ. This also applies to any accompanying drawings, diagrams or illustrations.